Only a third of nurses have said they are willing to have the vaccine against swine flu amid fears it has not been tested enough, a survey has found. Frontline health and social care workers will be among the first to be vaccinated in October along with people with serious underlying health problems and pregnant women. However a survey by Nursing Times has found many frontline nurses have reservations. Only one in three said they are prepared to have the H1N1 vaccine with a third undecided and the rest saying no. Almost 1,500 nurses were polled, of whom 91 per cent said they were frontline. 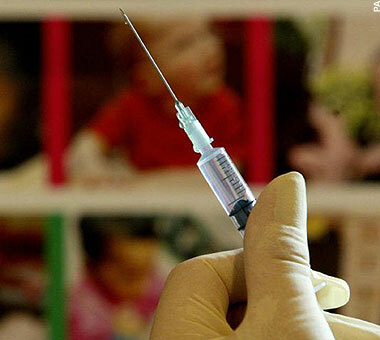 It comes after news that parents are also concerned about the vaccine, with worries predominantly about the safety of its contents, side effects, and the amount of testing that will be done. Of the nurses who said they would not get vaccinated, 60 per cent said concern about the safety of the vaccine was the main reason. A further 31 per cent said they did not consider the risks to their health from swine flu to be great enough, while nine per cent thought they would not be able to take time out of work to get immunised. “I would not be willing to put myself at risk of, as yet, unknown long-term effects to facilitate a short-term solution,” said one respondent. Professor David Salisbury, the Department of Health’s director of immunisation, told Nursing Times it was unfortunate that nurses could ‘knowingly leave themselves at risk’. Over two million frontline health and social care staff will be offered the vaccine in order to stop staff falling ill and being off work ill and also to prevent them from passing on the H1N1 vaccine or catching it from patients they will be treating. Christine Beasley, the Government’s Chief Nursing Officer, said: “Frontline nurses will be absolutely crucial in the height of a pandemic – without them, patient care will suffer, and the NHS will be stretched. “Getting the swine flu vaccine will protect nurses and their patients. That’s why we’re offering frontline nurses the vaccine as a top priority. As well as protecting them, it will reduce the transmission of the virus to vulnerable patients.